This sequel to Yockey's IMPERIUM shows that all wars are related to politics and the aim of politics is to obtain power. Who were the 'real' winners and losers of the World Wars and who is the enemy of Europe? 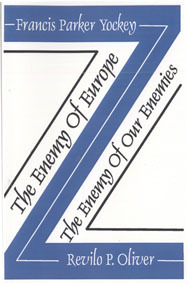 Includes Revilo P. Oliver's critique, The Enemy of Our Enemies. P/B 256pp.